The National Academy of Sciences, in their 2004 book “Safety of Genetically Engineered Foods Approaches to Assessing Unintended Health Effects” admits that GMO foods have a higher risk of unintended health effects. Monsanto sued over 1200 farmers for millions of dollars for patent infringement by once their crops got contaminated by GMO crops they did not want. Many farmers lost their farm this way. Monsanto presents those law suits as their successes on their website to their stake holders. Organic and conventional farmers’ crops are endangered by GMO operations through unwanted pesticide drift, genetic contamination, super weeds and super bugs created by high pesticide use on GMO crops. No small farmer will be fined or go to jail and no gardens will be confiscated. Any GMO plants currently in the ground can stay until they are done producing. Any new crops planted will have to be of a Non-GMO kind. The Moratorium protects small farmers from having to use more and stronger chemicals to control the newly resistant weeds and insects being created in and around neighboring GMO fields. 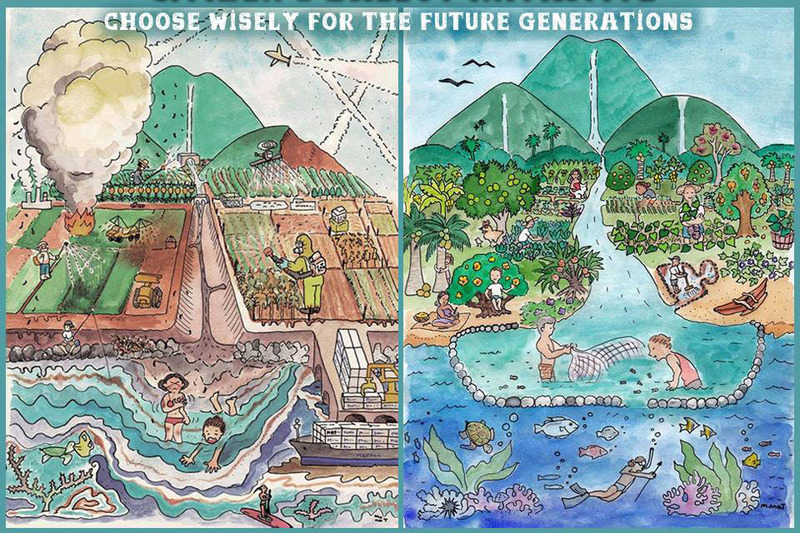 In Maui County two Chemical Corporations, Monsanto and Dow Chemical (Mycogen), grow GMO seed and test crops in an open-air laboratory, sterilizing the soil, creating ground water contamination, pesticide drift and run-off, threatening our fragile land and ocean eco systems. 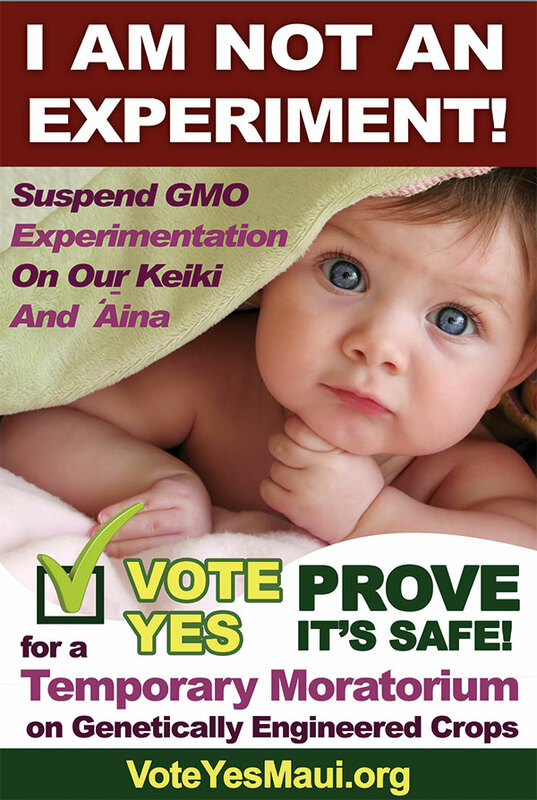 According to the medical community on Kauai, babies born next to GMO fields are born with ten times the national average of a rare heart disease (which requires them to get operations regularly to stay alive) and there are many cases of babies born with their intestines outside of their bodies, while others are being born with brain tumors. The Hawaii State Department of Health tested the surface water in a number of places around the islands in January 2014 and pesticides were found in 100% of their samples. Glyphosate, the active ingredient in “Roundup”, has been found in mother’s milk and in urine samples of Maui residents, and in the water supply in Kihei. Research links Glyphosate to autism, cancer, liver and kidney failure as well as gastro-intestinal problems. 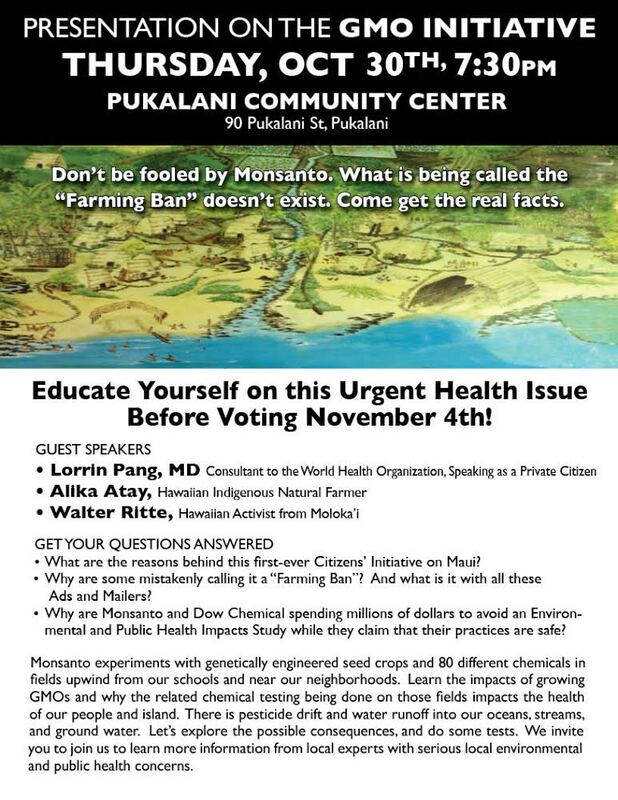 A number of school children in Molokai got sick and had to seek medical attention when Monsanto was spraying pesticides next to the school. Many nations consider GMOs unsafe. More than 30 nations including China, Japan, Russia, Australia and the entire European Union have significant restrictions or outright bans on GMO foods and crops. 64 countries have labeling laws. GMO lobbyists tried twice, last and this year, to get the Hawaii State Legislature to strip away our County’s rights to pass local agricultural regulations that protect us. You can be sure they will try it again, so this opportunity to pass a County voters’ initiative may be our last. Genetically engineered life forms cannot be recalled once released into the environment and can contaminate the natural non-GMO life forms through cross-pollination as with the Hawaii GMO Papaya. On the Big Island 80% of the Non-GMO papaya has been cross contaminated by the GMO papaya and this problem is irreversible. The Big Island Papaya export market has crashed and is half of what it used to be for Big Island papaya growers (now GMO contaminated) because many countries ban GMOs or consumers reject them. 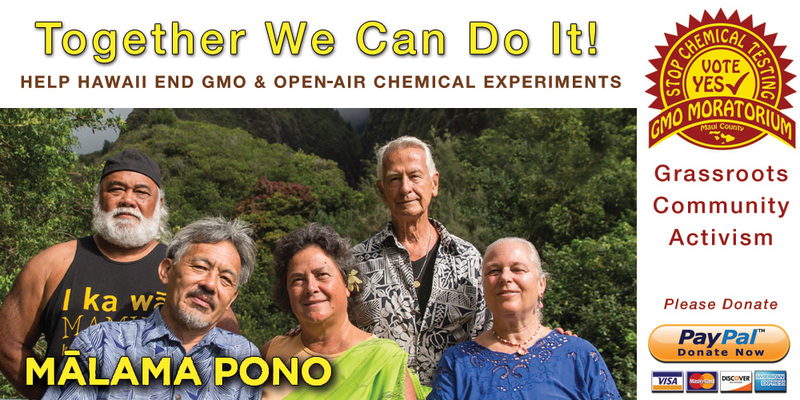 Only Monsanto and Dow Chemical (Mycogen), who represent only 1% of all farming operations in Maui County, grow GMO seed and test crops commercially and conduct open field GMO and pesticide experiments. Therefore, 99% of all other non-GMO farming will not be affected or helped by the Moratorium. 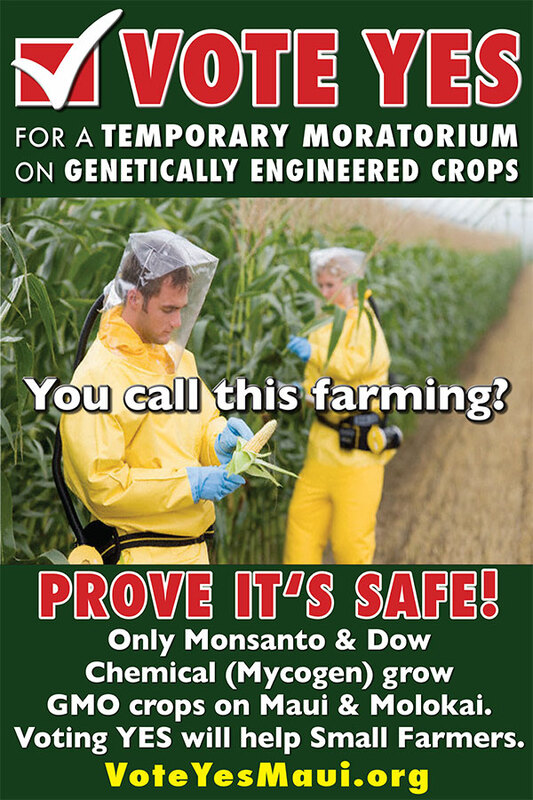 Monsanto is the corporation that produced Agent Orange, DDT, PCBs and now GMOs and has claimed them all to be safe. Even today babies are still born with severe birth defects in Vietnam from the Agent Orange used over 50 years ago during the Vietnam war. Monsanto and Mycogen are Chemical Corporations, not Farmers. GMOʻs are designed to withstand large amounts of chemicals and require more and more chemicals every year which allows for ever greater profits. Over 280,000 Indian farmers have committed suicide because their GMO crops failed multiple times, and they ended up in insurmountable debt to Monsanto. In Indian law, any debt incurred is carried by the male head of household and will not carry over to the family upon his death. This was the only way for these farmers to save their farms and guarantee the survival of their families since their livelihoods depended upon the farms. The Project Manager of Mycogen on Molokai, Adolf Helm, started the “Citizens Against the Maui County Farming Ban”, and Mycogen (Dow Chemical) and Monsanto have already spent over 6 million dollars for advertising hiding behind this so-called “citizensʻ group” that was created to confuse people and can lie and not get in trouble for it. It claims that small farmers will be hurt, possibly facing high fines and jail and that many jobs would be lost. According to the Hawaii Department Of Agriculture, there is not one State law or regulation on genetically engineered crops in Hawai’i. 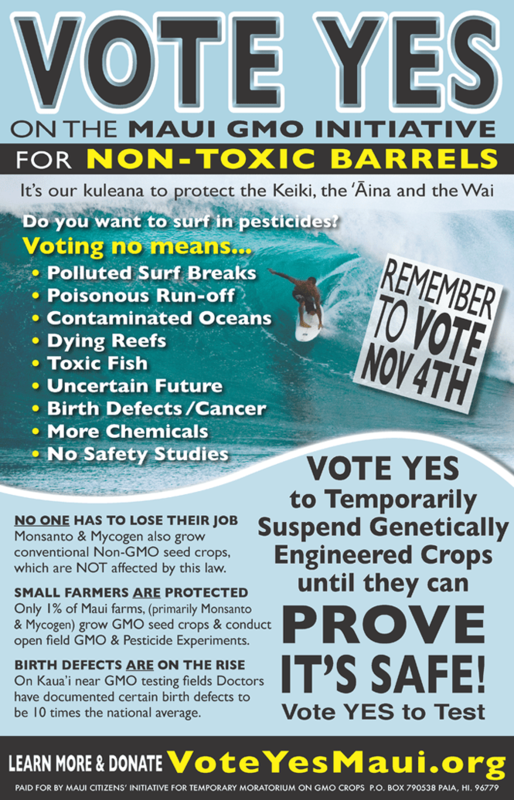 Monsanto uses Maui County as its GMO corn seed factory for the world producing 80% of their GMO BT toxin corn seed. Two unrelated families living next door to the Kihei Monsanto operations had family members getting seizures which subsided in both cases only after they moved away. There are so many Health complaints by people living downwind or working in Monsanto’s fields in Kihie that the Department of Health has started an investigation into the causes. 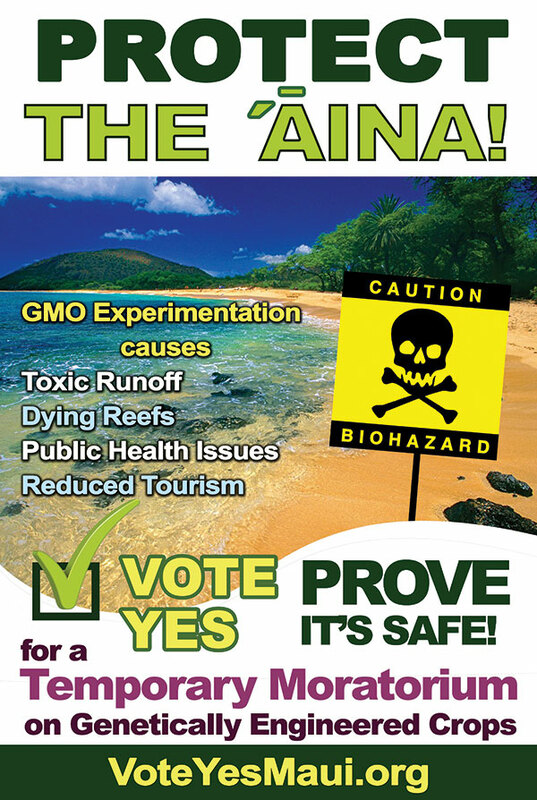 On the ballot the GMO Moratorium is called MAUI: Voter Initiative: Genetically Engineered Organisms. It proposes a temporary suspension of the cultivation and reproduction of GMO crops until an Environmental and Public Health Safety Study proves NO HARM to our land and our health. While the sensationalized ads claim that 600 jobs will be lost, Monsanto and Mycogen have never officially stated this in public. When asked by the press if they would lay off all their employees, their official answer was that there “might” be “some” jobs lost. There is no need for a loss of jobs, because these companies can and have already begun to switch back to non GMO seed crop production as Monsanto recently announced at a Hawaiʻi Farm Bureau meeting. The world demand for GMO seeds is dropping anyway due to the growing number of countries banning them and the growing consumer rejection. If we continue with the GMO practices our biggest industry, the tourist industry, will be in grave danger once people around the world find out about the level of toxicity and health issues we are facing. This is not a pesticide law and does not restrict a local farmer’s right to use pesticides. The only GMO crops currently permitted on the world market are BT Feed Corn, Soy Beans, Cotton, Canola, Sugar Beets, Alfalfa, BT Sweet Corn, Yellow Squash, Zuccini, and “Rainbow” papaya. Monsanto and Mycogen are chemical companies, not farmers. Is this what you want for Maui County? Is this what you want Maui to be known for in the World? 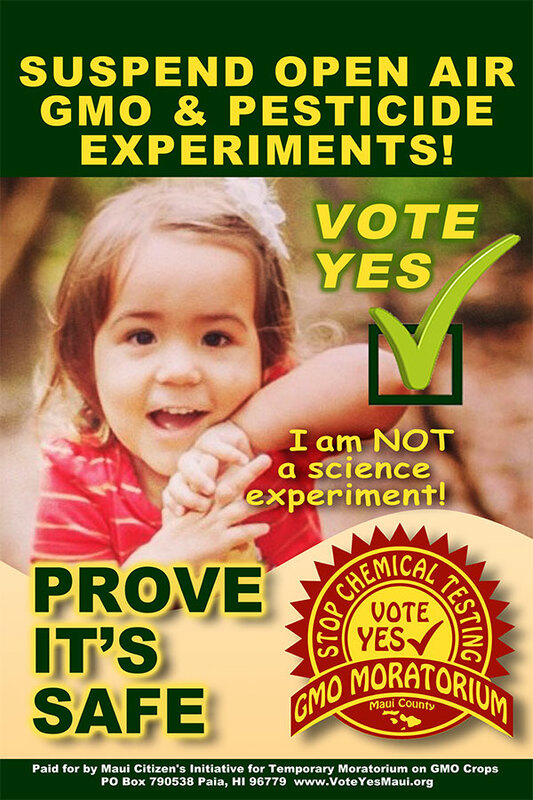 Are you willing to risk your children’s lives on no testing? Are you willing to take a stand for this land and our way of life? The SHAKA Movement is an advocacy, communications and educational outreach program and hub, where people and organizations come together to work in unison toward sustainable practices to affect a positive change for the environment and for the people of the Hawaiian Islands. Please watch these videos to quickly understand our current activities. The Petition Turn-in Ceremony. Monday,April 7th. The day everything changed on Maui.